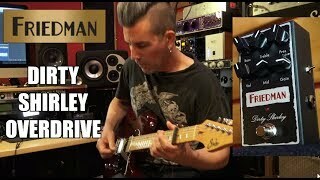 The Friedman Dirty Shirley all-tube amp is well known for being one of the most flexible and touch-responsive single-channel amplifiers on the market. Now you can get that same tonal versatility, sensitivity and harmonically rich overdrive in a pedal. The Dirty Shirley Overdrive packs the same intuitive control set as the amplifier, allowing you to dial in your perfect shade of rock in no time. It doesn't matter if you want a high-output cleaner tone for pushing your amp hard or a thick gritty drive that will sit well in any classic to modern rock band, a sweep of the gain control easily gets you there. If you ever want reign in the low end, for a punchier feel, simply flip the side-mounted Tight switch and away you go. If you want to experience the amp’s accolade-garnering tone in the convenience of a pedal, put the Dirty Shirley Overdrive on your board today. The Dirty Shirley Overdrive pedal delivers tube like tone in a small pedal format which can be used either into a clean amp or to boost an already over-driven amp. If your amp, or other overdrive gets a bit loose in the low end, throw ON the Dirty Shirley's Tight switch to bring back the percussive attack you crave.